Riding Gloves There are 7 products. 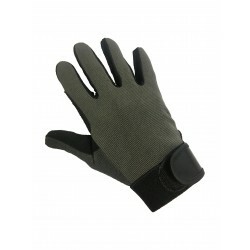 Fantastic Shooting Glove perfect for any type of shooting or even as a multi use work glove in the yard or the garden thanks to it's tough and grippy exterior. A classic Dressage design crafted with the finest lamb skin leather to ensure flexible secure contact. A truly technically advanced glove designed to ensure a comfortable and secure contact on the reins at all times. A modern Hunter glove with classic styling crafted from lamb skin leather providing incredible comfort and performance. An excellent performance glove with Tredstep's exclusive Wet-Tec super grip palm that increases grip in those wet conditions. High performance Tredstep gloves with Wet-Tec technology for secure grip in wet and dry conditions.